Regional Liaison Rebecca Stanfill with “Red Carpet Award” Winners from Delaware County. Pictured from left to right, Larry Fraker, Rebecca Stanfill, John Rybka. COLUMBUS – Ohio Secretary of State Jon Husted has awarded four precinct election officials (PEOs) with Red Carpet Awards for their dedication to running good elections in their communities. It takes approximately 35,000 PEOs, or poll workers as they are commonly known, to manage polling places on any given Election Day in Ohio, and the individuals being recognized are among the best who serve voters. The honorees include John Rybka (Democrat) and Larry Fraker (Republican) from Delaware County, Mary Roederer (Democrat) from Guernsey County, and April Kamentz (Republican) from Warren County. Larry Fraker is responsible for the Delaware County Board of Elections’ absentee mailing department. This role requires knowledge of both the inserting machine and ballot verifier used for incoming mail. Larry’s ability to get these machines working properly and running smoothly has earned him the title of “Machine Whisperer” by board members. John Rybka has been a PEO and provisional specialist for several years, and this past year he was asked to serve as the temporary Democratic PEO recruiter. He was so dedicated to this role that others often had to remind him to eat lunch or even go home. The night before the election, John ended up in the hospital, but rather than worrying about his health, his main concern was whether or not he would make it to the Delaware County Board of Elections on time for Election Day. April Kamentz has been a committed member of the Warren County Board of Elections’ team for over 12 years and is constantly looking for ways to improve efficiency for voters. April coordinates the nursing home voting program. Every election, she visits each of the 25 nursing homes in the county twice to ensure that the voice of elderly residents are represented. On top of that, April coordinates part-time staff to run the early voting center, trains teenagers that are a part of the election night process, and is a rover on Election Day. Mary Roederer has served as a Guernsey County PEO for 54 years without missing an election and looks forward to serving many more. She has many fond memories of the elections and has withstood many changes in the election process over the years. Upon his election, Secretary Husted established the precinct election official Red Carpet Award to recognize the service and dedication of poll workers throughout Ohio. This program is part of his ongoing work to aid Ohio’s 88 boards of elections with the recruitment, training and retention of good elections officials. Awardees are nominated by boards of elections and chosen annually by the Secretary of State’s office. 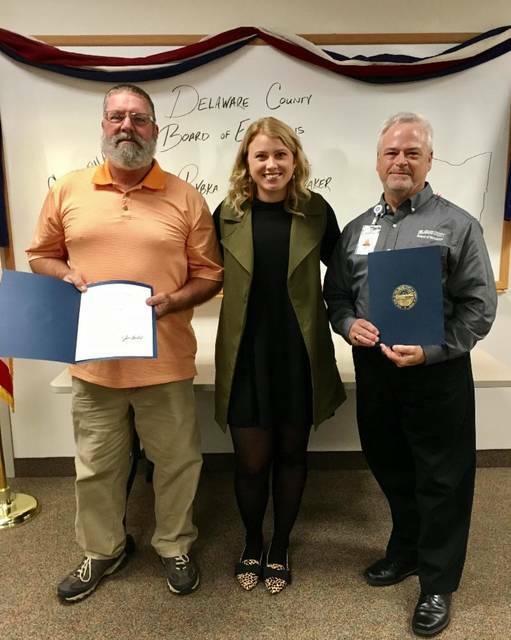 https://www.sunburynews.com/wp-content/uploads/sites/48/2018/11/web1_Delaware.jpgRegional Liaison Rebecca Stanfill with “Red Carpet Award” Winners from Delaware County. Pictured from left to right, Larry Fraker, Rebecca Stanfill, John Rybka. For more information or to sign up to become a poll worker, please visit www.DayforDemocracy.com.